There are lots of us out there, you know? The friendly, non-competitive types who listen to “Fun Fun Fun” by the Beach Boys and equate it to our video game time. We don’t want the stress of trying to best our fellow man (or woman – you’re not getting me that easily, Internet). We don’t have the time to spend getting good at the latest Call of Duty or FIFA, and we don’t want the abuse that comes from being poor at them, either. No, we are happy eking out our little corner of co-operative niceties, helping one another and being generally boring little people. Or so I thought. Because along comes a game like Pivvot and changes everything. Connecting, as it does, to Facebook and pitting you asynchronously against your friends to see who can come out on top becomes a nightmarish war of attrition. Who has the most staying power; who will wipe the floor with the competition on the leaderboards? 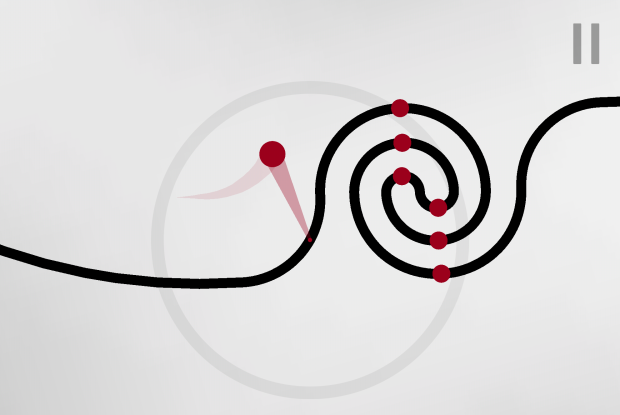 At a base level, Pivvot is a game about reactions. 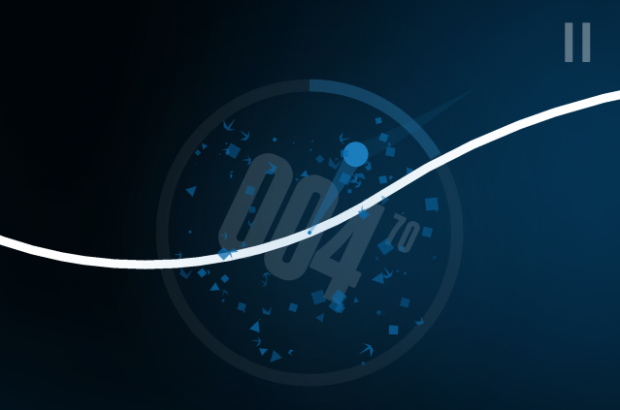 As a pre-defined squiggly line becomes ever faster, your task is simply to press the left or right side of your touch device’s screen to literally move your object (that is attached to the line), in order to avoid all manner of obstacles – you are literally pivoting on that line. And at first it’s easy to not “get” the game, as the initial modes available aren’t monumentally tricky. 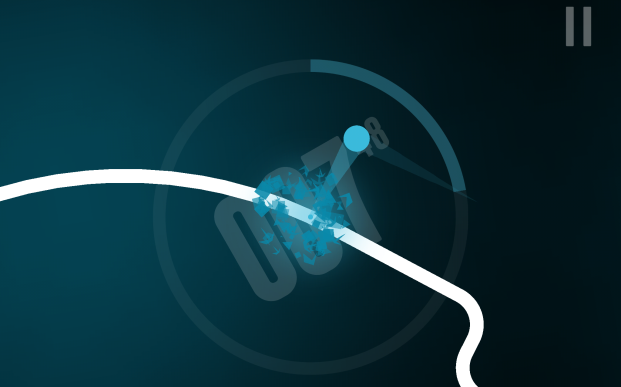 Voyage is more of a tutorial, introducing you over 20+ sections to the initial types of obstacle, slowly presenting more and more, before finishing with the first tricky one – that damn circle. At this point, it’s a case of reactions combining with memory skills, before moving onto Expert Voyage, which follows the same principles but is – obviously, given the name – more difficult. If you only played Voyage mode, you could be forgiven for wondering what all the fuss is about, because they really are only tutorials – the leaderboards for this mode are based on completion, rather than time, so it’s just a case of finishing them up and moving on to the real meat of the game: Endless mode. Endless mode could so easily have been called survival mode, as that’s what it’s all about and is also where the leaderboards come in to play. Here, things get gradually more frantic and speedy over a looping 50 second period. This is all about memory and knowing what will come next, preparing yourself and executing it – a perfect storm of iOS gaming. Suddenly, those uncompetitive folks are playing Pivvot on every lunch break, on every train ride, because we have to beat our friends who have just topped out at 139 seconds (I’m coming for you Lee, there’s no place left to hide). Expert Endless becomes available once you’ve hit 100 seconds, and Berserk mode once you’ve made 100 seconds on Expert. Berserk mode is aptly named, as memorising patterns will get you nowhere, such is the craziness. It’s also worth mentioning that the developer intends to add even harder modes, the utter monster. Throw in some cracking features such as the ability to share a video of your performance directly to Twitter and Facebook, a gorgeously intense soundtrack and pulsating, yet minimalist, visuals and you’ve got an absolutely wonderful game worthy of anyone’s time. VERDICT: Games like Pivvot make absolute fools of people who think iOS isn’t a legitimate gaming platform. It’s hugely addictive, and brings out the competitive side in everyone but, best of all, it gets people talking, which is worth celebrating. And hey, I didn’t mention Super Hexagon once.